The sun affects our lives to a much larger extend than what we have been aware of so far. Since our Sun is heading towards a rare activity maximum, it is most likely that we will be directly affected. Undoubtedly our sun determines our life. Without our sun there would be no life on earth - the sun creates and sustains life. But it has an influence on human life that goes beyond the physical and biological aspect. Our sun influences our emotions and our consciousness and this influence extends to the point that one could even ask whether it may be possible that the sun determines our collective destiny? If we include all available scientific data into the equation, this question can be answered with a clear yes. In the past decades, heliobiology has greatly advanced, taking into accout relevant data from nearly all disciplines of science - from astrophysics, radio astronomy and geophysics, to the medical fields. Summarizing the most relevant research, we can clearly say that the Earth is in a process of a comprehensive transformation in which our sun plays a major role. Solar acitivity has a significant influence on the electromagnetic fields of the earth. Other factors i.e. radio waves and gravitational waves emerging from the center of our galaxy are additional variables which interact with each other and effect our biology. Our moods and state of consciousness are determined by our neuro-chemical molecules (neurotransmitters and hormones), which can be activated and / or inhibited by these fields. The relevance of external electromagnetic fields for the neural structures of our brains become apparent when you take a look at the the resonant frequencies of the earth - the so called Schumann resonance frequencies – which are virtually indistinguishable from the electromagnetic fields of the human brain (see Fig. 1 below). Fig. 1: The left side shows two electromagnetic frequencies of the Earth (Schumann Resonances). On the right side you can see two EEG measures of electrical activity of the brain of a human. The paralells in this graph confirm that the psychological and mental aspects of our human body interact with with external natural fields. Our body is constantly in communication and interaction with its environment. Like the EM fields of a cell phone are not confined to the spatial mass of a cell phone - and interact with remote EM fields and EM waves, there are direct connections between the EM fields of our body and the EM fields of the sun. Basically in our biological body is constantly in direct contact with EM fields from the entire cosmos. The prerequisite for this is the resonance , the equality of frequencies. Resonance occurs when the frequency between the transmitter and receiver are the same. Recent research suggests even a resonance between the radio waves of a supernova located in the center of our galaxy and the resonance frequency of our DNA. Since the resonance frequency of our DNA was discovered, some specialists in astrophysics have been on the lookout for such frequencies in space. The frequency in question is 150 MHz. As it stands, some radio astronomers have already been successful. Both our active sun, and some high-energy radiation sources from the deep reaches of our universe, emit the resonant frequency of our DNA. I have been aware of the effects of 150 MHz based on my own scientific studies for a long time. These radio waves (150 MHz is a frequency in the range of radio waves) can cause hallucinations in humans exposed to this field. These hallucinations can raise our cognitive abilities significantly and this effect can cause an increase of awareness. Due to the observed increase in the intensity of cosmic radio waves, it is inevitable that these events will have an impact on our perception and our consciousness. 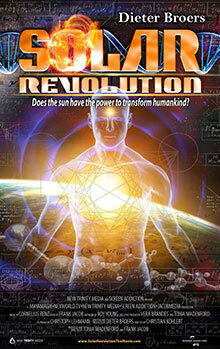 How exactly these factors affect our consciousness, is shown in my film SOLAR (R)EVOLUTION. Thank you for joinig us on this journey!